As the local saying goes, if you don’t like New Orleans weather, stand still for 10 minutes. It’s bound to change. 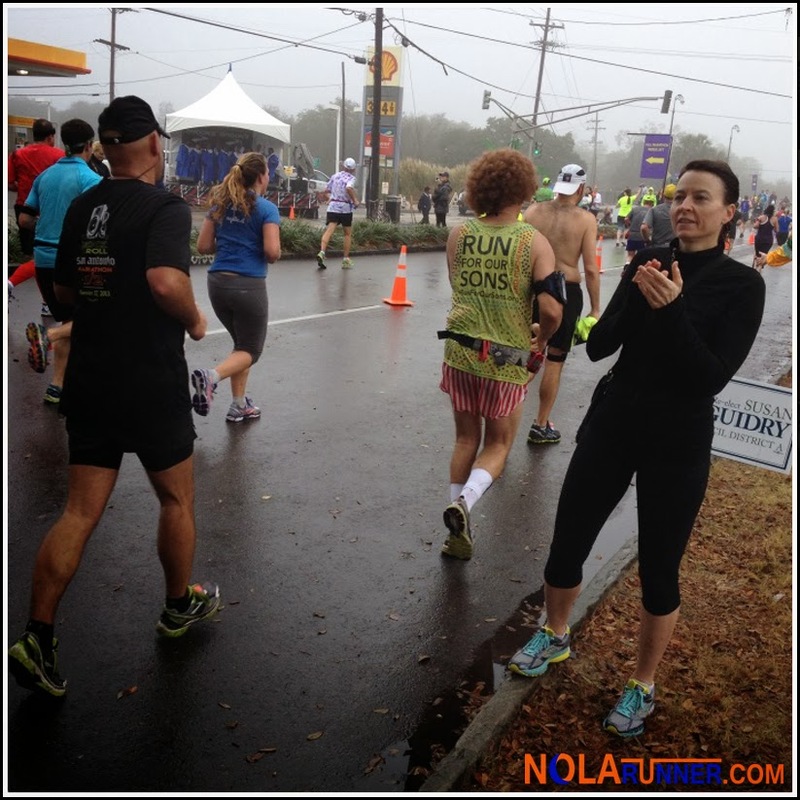 No one knows that better than those runners who participated in yesterday’s Rock ‘n’ Roll New Orleans Marathon and Half. Less than ideal conditions greeted participants who rolled out of bed to face damp, rainy and humid conditions on race day. In its fifth year of being a Rock ‘n’ Roll race, the 2014 field was comprised of more than 16,000 participants led by multiple world class elite athletes and Olympic contenders. As a participant in the first four events, I had a pretty good grasp of what to expect come race morning, but nothing can account for surprises brought on by Mother Nature. Hitting the RnR Health and Fitness Expo on Saturday morning had me feeling like a VIP. There was a special booth set up for all of the “5 Years Running” participants who had signed up to continue their streak. At this booth we received a special black bib with our number and the 5-year logo, along with instructions to visit the Rock ‘n’ Roll booth for a congratulatory gift. Organizers had designed special bottle opener key chains just for us, and hung a banner with all of the “perfect” participant names. It was a really nice and personal way for RnR to show their appreciation. Race morning I stepped out my door extra early, but was surprised that the rain had started sooner than expected. I was wearing a white shirt, which I contemplated changing, but knew that while I wasn’t going to win the race, I stood a decent shot at the wet t-shirt contest. After witnessing two accidents on the interstate headed downtown, I parked not far from the start and found coworkers and friends who were also running. Anne was running her first half marathon, and anxiously speculated about what 13.1 would bring. We hung out and talked about race strategy, but I decreed that the only strategy we both needed was to do whatever it took to finish. The national anthem and first starting gun could be heard in the distance, so we headed to our corrals to await our turn. I ran the first part of the race with Kevin, a coworker and friend who I race with regularly. He was tackling his second half, and had attainable goals in mind. We agreed to run together for as long as possible, but I would fall back when I was ready to go at a slower full-marathon pace. At mile 6 we separated, which was necessary for me. My shoes were already soaked from the rain and sweat, and hot spots on my feet were starting to be felt. I knew in order to complete another full, slowing down was the best option. I saw several friends along the route, including Jonathan at mile 8, and Katherine and Kyle volunteering at the water stop in mile 11. Friendly faces are always welcome, and with the lackluster weather, they were some of the brightest spots of the day. Splitting off from the half marathon at mile 12 is always a torturous case of mind over matter. Saying to yourself that you’re ready to double up while the finish line is in earshot separates the sane from insane. I knew that I wanted to take on the full, so I trudged on. Also knowing more friends waited on the sidelines of the second half pulled me forward. My parents weren’t in their usual spot at mile 14, but Christina and DJ Rob Fresh were in mile 15, and Stephen was in miles 19 and 21. I liked the setup they had for Rob in that stretch where speakers were blasting music for participants roughly every quarter mile. The following loop along Lakeshore Drive was rough. My month of mileage caught up to me at 18, and I kept doing the math in my head figuring out what pace I needed to run/walk to keep my finish under 5 hours. Blisters and tightness in my quads got the best of me, as several stretch breaks were needed. On the run back to the finish, I saw Christina at the same spot, which was mile 23. Coincidentally, that’s where her mom meets me when I run the marathon in her hometown of Chicago. We took a photo together, and I trudged on. I was elated that my parents had arrived to see me just before mile 25, which was just the push I needed to get to the finish line. After crossing, I grabbed handfuls of PowerBars, chocolate milk, Gatorade, and kettle corn. I was still soaked, and the skin on my hands had pruned, so drying off was top priority. 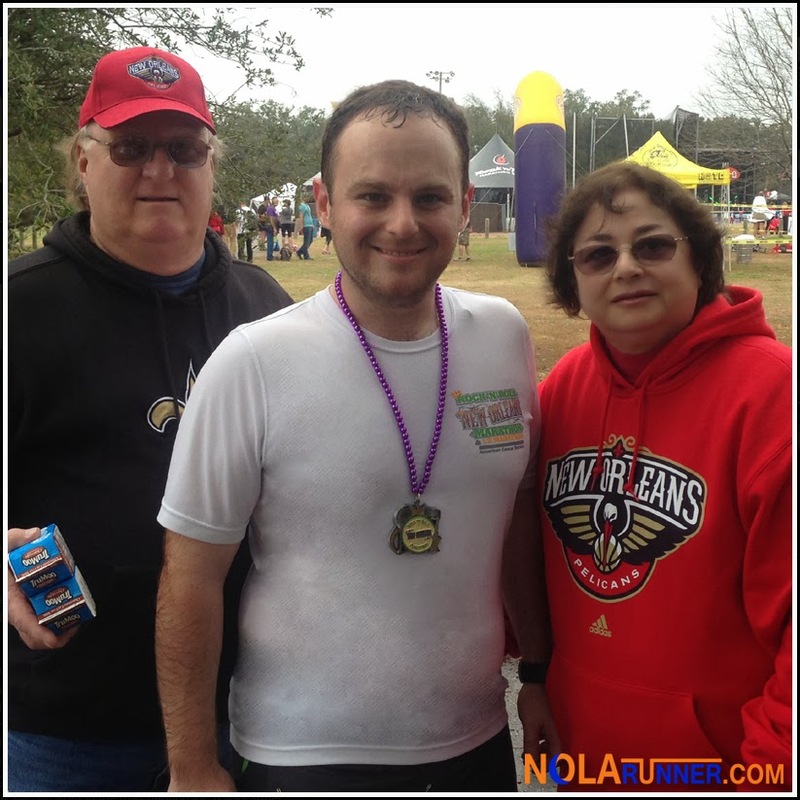 At Rock ‘n’ Roll New Orleans, I completed my third marathon in four weeks. Judging by my finish times at each of those races, it was definitely a case of quantity over quality. Moving forward, I want to focus on my strength and conditioning to get back in to sub-4:00 shape and hit several PR goals before the end of the year. My only concern at this New Orleans race, aside from the uncontrollable weather, was with the water stations along St. Charles Avenue. I’m not sure that organizers and the amazing volunteers were ready to have so many participants converge at one time to get fluids, so it was a little messy to maneuver. After leaving the Uptown area, the course widens and runners thin out, making the flow much smoother. I’m thrilled that so many of my friends ran the race this weekend, including many who finished their first endurance event. The Competitor Group took over the New Orleans Marathon in 2010, bringing their Rock ‘n’ Roll branding to the race. Along with that branding, they have brought countless runners from around the world to the Crescent City and doubled the race’s field. That achievement is something for which I’m grateful, as it strengthens the running culture in our city. I have completed Rock ‘n’ Roll Marathons in five various destinations, and I will say that while they do put on organized events, I’m a fan of locally executed races that embrace the hosting city. However, of the Rock ‘n’ Roll events I’ve attended, the New Orleans race pays the closest attention to the overall experience its participants enjoy. 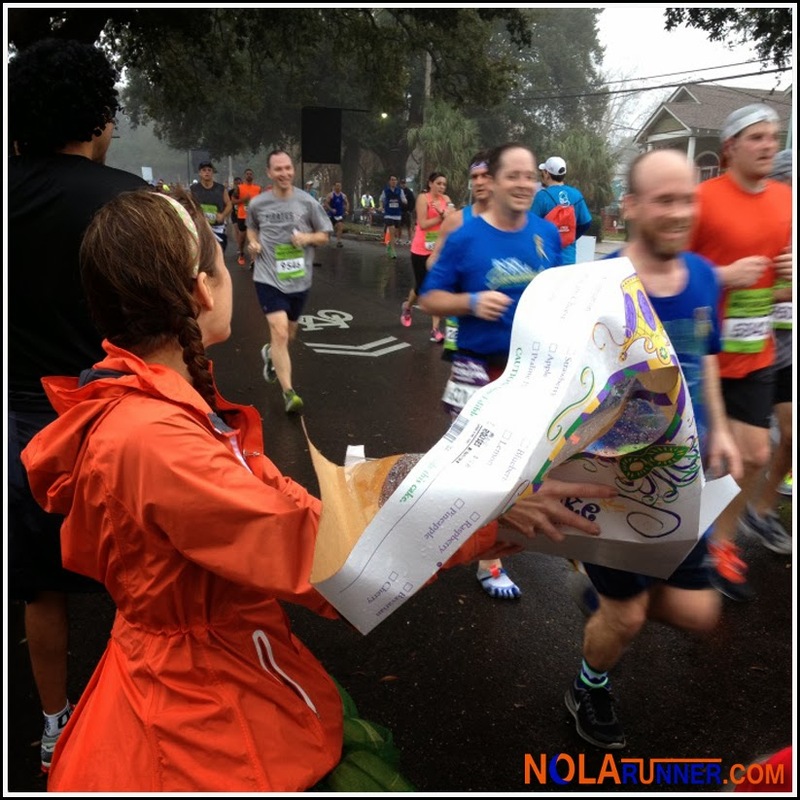 The course, particularly for the half, is stellar and showcases great landmarks in the French Quarter and beyond. 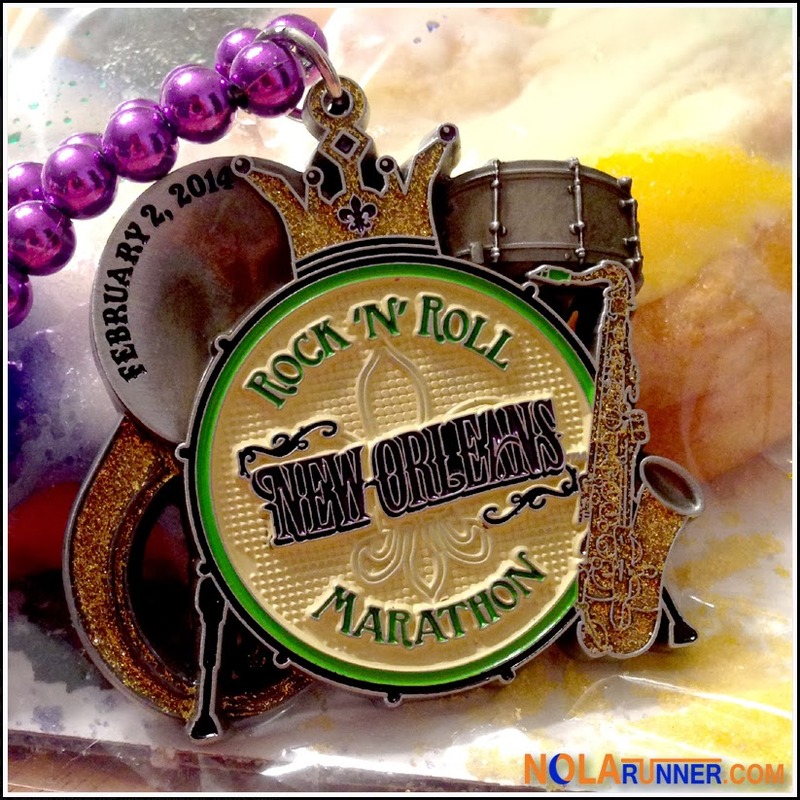 The design of medals, participant shirts and signage always sticks to the Rock ‘n’ Roll theme, but draws from the deep musical roots in New Orleans. This attention to detail makes me proud to claim the race as my hometown marathon, and makes me hope that I’m a 10 year participant in 2019. Thanks to Stephen and Kevin for providing a couple race day photos for use in this recap. 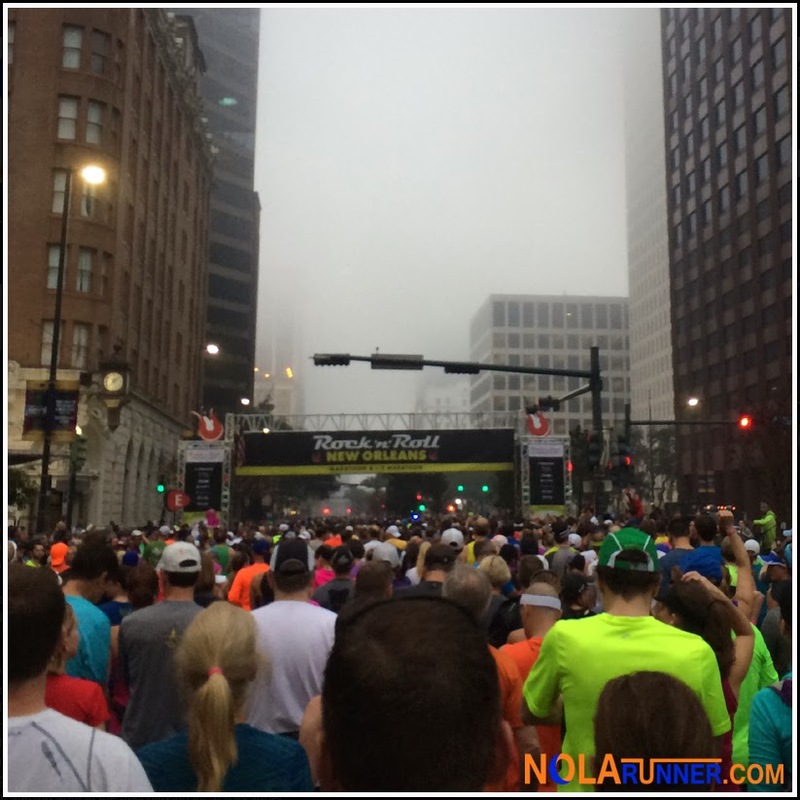 For more photos from the 2014 Rock 'n' Roll New Orleans Marathon weekend, LIKE the NOLArunner Facebook page HERE. Great recap Fred! Props to you for having it up so quick. I am still in brain fog mode. Despite the weather I truly loved this race. You always remember your first Half and I will always remember my first Full. I am glad I got to see you at the expo as well as the race. Congrats to you my friend! Congrats on your first full Nicole! Wait til you come out of that fog... I'm sure you'll have another race planned out soon. As you can see due to my type above I had no business even responding to blogs yesterday lol. I finally got some sleep last night. Feeling better and starting to get my thoughts down. What an amazing experience. Interesting tidbit about the water trucks from Karen below I was wondering about that myself. 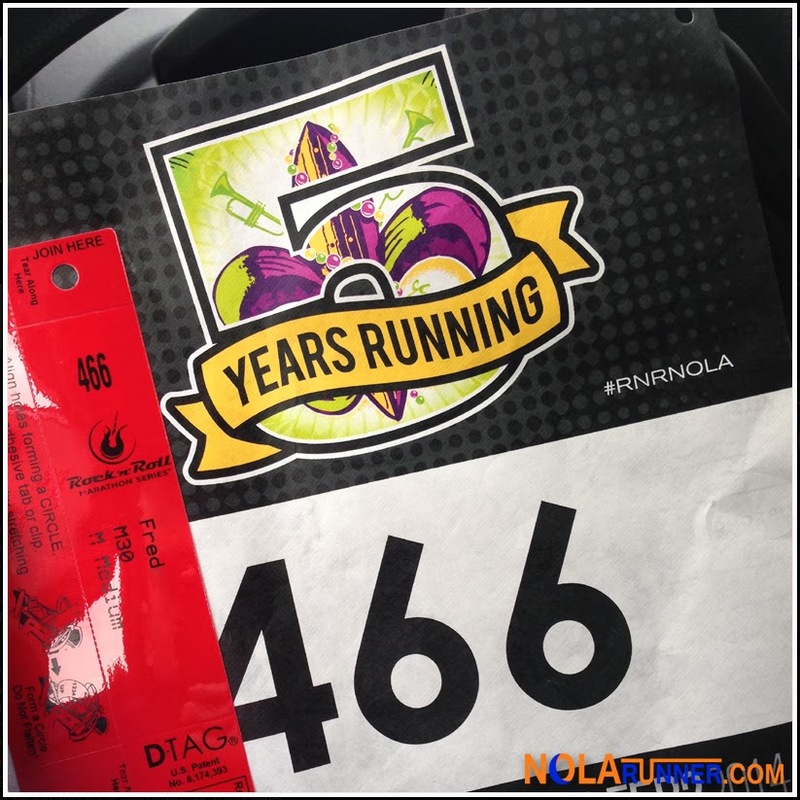 Congratulations on 5 consecutive RnR NOLA races! That's just awesome. It absolutely made my morning to see you at the water station, since I wanted nothing more than to be able to cheer on my friends. I couldn't be more proud of you for persevering through the challenges brought on by this race, and for getting such a great start to your 2014 running goals. Excited to hear about your next endeavor. P.S. Who won the wet t-shirt contest? We saw so many bloody-nippled men run through our water station... yikes. Thanks for coming out to support and volunteer, Katherine! I was glad I was able to harass you during the race. You were at a great spot as I faced the half/full decision on Esplanade. As far as the wet Tshirt contest goes, I have yet to hear the judges' decision; however, I'm sure my booby prize is in the mail. Awesome recap, Fred!! This year was such a tough race...and I'm super impressed, 3 marathons in 4 weeks?! You're amazing! :D It was great seeing you on the course! Congrats!! I was so dazed when you came up to me on-course, Karen. Great seeing you too, and congrats on another finish! That is interesting about the water stations and tables. I knew something must have occurred. I'm sure they'll be better prepared next year. My water station at mile 11.5 had water trucks arrive at around 6:30 a.m. We scrambled to set out cups, pour water in them, and for my half of the station, make enough Gatorade for the cups and for the cups we'd later need to make and fill when more runners came through. I think we were very well-prepared and we did not run out of water or Gatorade at all, but I imagine it would have been very tough for water stations near the front of the course if they hadn't had an hour or so to work on the setup before the first runner arrived. Those stations really need to be equipped at around 5:30 a.m. with water delivery around that time. It took about an hour to get everything ready in our case. Interesting insight from someone who was working behind the table. Thanks, Katherine!